Since we opened our second salon 'Paul Kemp Hairdressing' 6 years ago we’ve had a number of stylists switch across from one to the other. As the old saying goes “a change is as good as a rest” and Matt decided that he was happy for a change of scenery. The move came about due to one of the PK team members deciding to move on, leaving a gap at stylist level over there. 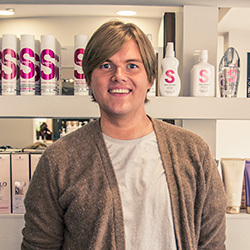 Matt was a great choice to fill the void as he’s looking to increase his client base and being the only stylist at that level over there it will help boost his clientele. The Jakata team were all sad to see him go over to 'the dark side', but as it’s only around the corner we’ll certainly still be seeing a fair bit of him, though his presence in the salon will be missed! If you’re a regular client of Matt’s here at Jakata then we apologise for any inconvenience, but I’m sure you’ll enjoy the change too. Paul Kemp Hairdressing offers the same fantastic service that you’ve come to love here, and the team are equally warm and welcoming.